Rail company Hitachi has unveiled the first of its new 125mph Intercity Express trains that are being built in County Durham. The state-of-the-art £82m factory at Newton Aycliffe was opened in September 2015 with the aim of ultimately creating 900 new jobs at the site. The plant is building 122 new Intercity trains to carry passengers on the Great Western and East Coast main lines. By 2020 Hitachi will have 281 trains running on the UK rail network. The first of the new trains were unveiled at a ceremony attended by Transport Secretary Chris Grayling, Northern Powerhouse Minister Andrew Percy, and Japanese ambassador Koji Tsuruoka. Karen Boswell, managing director of Hitachi Rail Europe (HRE), said: “Today is a celebration of the return of train manufacturing to the North East, supporting thousands of jobs and developing a strong engineering skills base in the region. “Trains running across the country’s rail network will be built by a proud workforce harnessing the best of Hitachi’s long standing rail expertise. 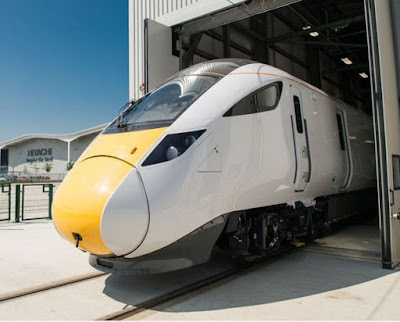 The company that built the world famous bullet trains is now building the next generation of UK trains, which will deliver a step change in intercity travel, offering more capacity, greater comfort and a lower carbon footprint. “HRE is committed to the transformation of UK rail. As our new IEP (Intercity Express Trains) trains become operational, they will bring UK rail travel firmly into the 21st century. Hitachi’s investment in County Durham is part of plans to employ 2,000 people across 14 sites around the UK. The company also hopes to support thousands of jobs in the supply chain. David Horne, managing director of Virgin Trains East Coast, which will see production of its new trains at Hitachi next year, said: “It’s a great privilege to be given a tour of these new facilities which will provide a big economic boost for the North East.